Last year I went part time at my old office job to concentrate on playing poker. It went well and I also started writing more and more, which was also proving financially rewarding. At the start of this year I left the 9-5 forever and I spend about 40% of my time writing about poker and 60% playing. When things are going well I tell people I'm a professional poker player and when they are not I'm just a writer. This Thursday I put down the cards and pick up my jotter pad and pen where for the next 12 days I will be one of those people you see hanging round a poker table trying to guesstimate the amount of chips Daniel Negreanu has. 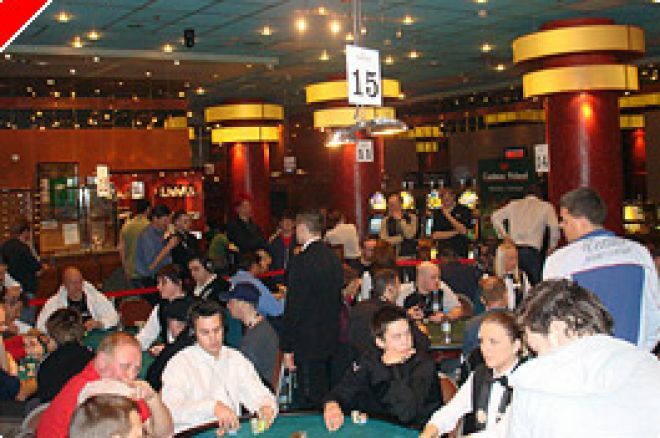 Poker blogging, as it is known, for Pokernews at the WSOPE. Poker blogging requires one to wander around the tournament floor and count how many chips the players have. It's about looking out for some of the craziest hands and bust outs and then reporting them back in real time on your website. Anyone who blogs about poker is a poker player, and a good one at that, they have to be to report it back effectively. Blogging is loads of fun at times but unbelievably frustrating too. When you are equally used to being the one sat at the table, having to stand behind Roland De Wolfe as he contemplates a call can be demoralising. I liken it to being a League 2 footballer having to be a kit man for the England squad during the World Cup – you tell yourself you would do anything to be there but you think you're above it when you do. The most hugely frustrating thing about blogging is standing watching the action as some internet qualifier is making some of the most amateur moves at the table. You see some plucky Scandinavian min reraising with king-seven, getting lucky on the flop and scooping one pot more on their way to a fortune and you wonder how the hell you came to be jotting it down on a notepad. Sometimes you just want to scream out "Just call you idiot" or "That's it, give me your cards, you can't play anymore, GIVE ME YOUR CARDS!". Watching a cagey heads up match is the most frustrating, I know these guys have millions on the line and every decision is crucial to them, but don't they realise that we want to go out and drink after 3 or 4 exhausting days watching them? I have a friend who got into trouble with the website he blogs for when he screamed "Throw a diamond out there, please god throw us a diamond!" at the table during hour 8 of a gruelling heads up match. Of course I'm making it sound awful but in fact, its tremendous fun. Bloggers are a fun bunch and the chance to meet some of the greatest players on the planet is worth the journey alone. I'll be looking to score a few pictures stood next to Ivey, Negreanu and Brunson on my trip and thus losing any credibility I may have had. The WSOPE is quite simply the biggest event outside of Las Vegas and I cannot justify £10,000 of my bankroll to play in it, but I wouldn't miss it for the world. You can see all my WSOPE Live Updates here. Behind The Rail - Is Poker Cool?